The 57.5 metre sailing yacht Twizzle, jointly listed for sale by Y.CO and Burgess, has been sold with Jim Wallace at Camper & Nicholsons introducing the buyer. Built in aluminium by specialist Dutch yard Royal Huisman to a design by Dubois Naval Architects, Twizzle was launched in 2010 as the yard’s first flybridge yacht. With one of the most advanced sailing rigs ever created, she offers extraordinary performance and carries 1,780 square metres of sail; both main and mizzen sails can be hoisted simultaneously in under two minutes in winds as light as five knots. 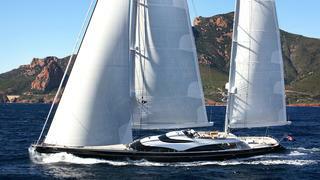 Twizzle was a winner at the 2011 ShowBoats Design Awards and was asking €39,750,000.